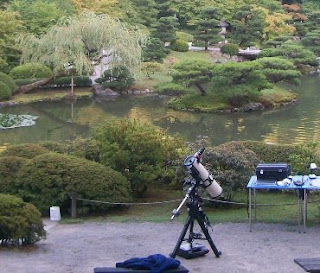 Caption: A telescope used for Moon viewing at the Japanese Gardens at The Arboretum, in Seattle, Washington. Why do people see faces in nature, interpret window stains as human figures, hear voices in random sounds generated by electronic devices or find conspiracies in the daily news? A proximate cause is the priming effect, in which our brain and senses are prepared to interpret stimuli according to an expected model. UFOlogists see a face on Mars. Religionists see the Virgin Mary on the side of a building. Paranormalists hear dead people speaking to them through a radio receiver. Conspiracy theorists think 9/11 was an inside job by the Bush administration. Is there a deeper ultimate cause for why people believe such weird things? There is. I call it “patternicity,” or the tendency to find meaningful patterns in meaningless noise. Traditionally, scientists have treated patternicity as an error in cognition. A type I error, or a false positive, is believing something is real when it is not (finding a nonexistent pattern). A type II error, or a false negative, is not believing something is real when it is (not recognizing a real pattern — call it “apatternicity”). In my 2000 book How We Believe, I argue that our brains are belief engines: evolved patternrecognition machines that connect the dots and create meaning out of the patterns that we think we see in nature. Sometimes A really is connected to B; sometimes it is not. When it is, we have learned something valuable about the environment from which we can make predictions that aid in survival and reproduction. We are the descendants of those most successful at finding patterns. This process is called association learning and it is fundamental to all animal behavior, from the humble worm C. elegans to H. sapiens. What turns an inference into a mistaken belief is lack of knowledge, coupled with a lack of willingness to try to expand that knowledge through learning and reason. The many mistaken beliefs in our culture, creationism, 9/11 denialism, birthers, and so on, are a product of these lacks. As a society, we seem to be becoming more ignorant and unreasoning, even as our knowledge increases. Why this is has at least as much to do with our lack of interest in education and learning as it does to anything. The show's run is ending, [WNED manager John] Grant explains, because no one — not the station, not PBS, not the Corporation for Public Broadcasting — will put up the several hundred thousand dollars needed to renew the show's broadcast rights. In a country that seems to be drowning in ignorance, no one can find a few $100k to keep a show on the air that teaches children why learning and reading is important. I suppose I shouldn't be surprised. The Bush Administration, after all, had no use for science when it didn't fit in with their propaganda. George W. Bush bragged about never reading newspapers. If there was ever an Administration less interested in intellectual endeavors, I haven't had the misfortune to live under it. Learning to be a skeptical, smart, observer of the world is a difficult thing. It requires acquiring an education, which requires considerable effort. That effort is often at the expense of doing other things that might be more fun, like going to movies, playing video games, or just hanging around with friends. As Dana wrote, it's an effort that has to continue for the rest of a person's life. For anyone who doesn't find that effort intrinsically fun, there needs to be some inspiration. That doesn't come from something as prosaic as wanting to earn a living when you're a child. Helping children realize that reading and learning can lead to interesting experiences can help provide that inspiration. With our population seemingly becoming more ignorant by the day, it's a shame that we place so little value on inspiring our children to be more interested in learning. The money spent on Reading Rainbow wouldn't put a new coat of paint on an F-22. Yet we can't manage to find the means. Maybe someone can take the money they saved on Reading Rainbow and add a few more explosions to the next Masterpiece Theatre. In a few years, that's what their audience will be looking for. I loved the part about teaching kids why to read. If we do that, we hardly even need to teach them how. Just having watched Idiocracy, I shudder at the notion of cancelling Reading Rainbow. The question I've heard more than any other regarding education is "Why do I have to learn this?". I've written about that before, and I think how we answer that question is just as important as how (potentially) good we make that education. "Just shut up and learn" isn't a good answer to anyone with a mind of his own, no matter what his age. Children don't know squat about the world. That's why we send them to school. It's only much later that many of them learn why they were sent there in the first place. In the meantime, more would succeed if they had some idea why, and if they thought it could be fun. "I Need To Be In Haiti"
When Will They Finally Catch On? Atheist Rampage in Des Moines!